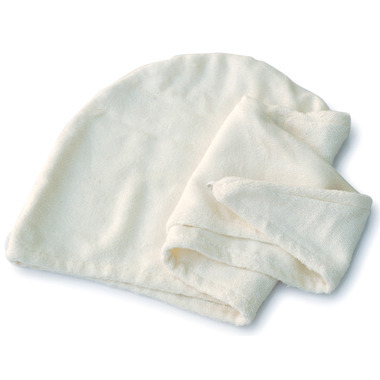 The Basicare Bamboo Hair Turban is designed to better help your hair dry than a regular towel! I bought one of these for my daughter and one for myself. We both have long hair. We have a hard time making them stay in with the button. Others we have tried fasten more securely. I really loved the idea of this hair turban. I have never used one before and is the perfect thing for wearing with leave-in hair conditioner. However, it has proven to be a bit problematic STAYING ON for very long! My head is not particularly small, average size I guess, with shoulder length hair and I wish it fit more securely and STAYED ON! Finally I no longer have to wear a giant towel on my head! This little guy absorbs water great & stays put! Love this towel! As someone with very fine hair, I find bath towels much too harsh on my wet hair and usually end up with a lot of breakage and even pain from wrapping with something heavy and large. My hair also really holds onto water so this is such a great option for me to throw on after a shower for a few minutes while I get ready. It dries quickly and doesn't snag or pull or put any unneeded stress on those locks! Love it. Fits perfect, gentle on my hair and absorbs well. I love this turban! I have owned many, and this is the best. Soft yet thicker and more absorbent than others.